We received a 10% increase in sales for the year for Tom’s of Maine toothpaste, attributed solely to this program. 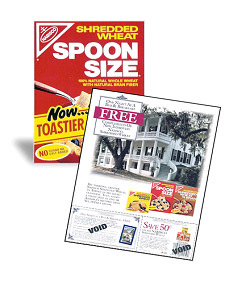 The best promotion in the 100-year history of Nabisco Shredded Wheat. We have used American Historic Inn promotions very successfully, and we will change to Minute Maid due to this promo. ILOVEINNS and the ILOVEINNS logo are trademarks of American Historic Inns, Inc.